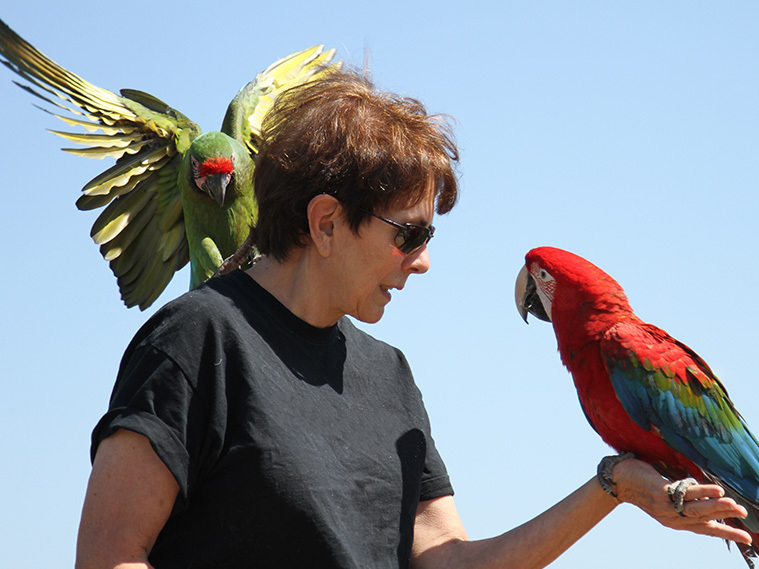 While being a mammal lover her entire life, Kathryne has only been involved with parrots for 20 years. Her parrot love affair began when she bought Pearl, an Umbrella Cockatoo. Who could ever imagine the impact one little fluffy white bird would have? Pearl is responsible for capturing Kathryne and her husband Rich and for bringing their hearts and minds into aviculture, into avian medicine, conservation, advocacy, and behavioral science. Idgie the Moluccan cockatoo joined the family more than 14 years ago when his original owner passed away. They have since added young palm cockatoo Rosie to the household and are enjoying the training opportunities that she brings. Kathryne spent her entire business career as a Capitol Hill staffer, and then a lobbyist, and the cockatoos helped her keep a proper perspective on life. She finally realized she did not want to interact with one more Congressperson so she and Rich decided to retire to San Diego, as far from DC as possible. Tragically, Pearl died unexpectedly of a heart attack a month before the move West. Kathryne’s journey into training has taken her to numerous workshops including with Steve Martin at Natural Encounters Inc., Dr. Susan Friedman, Barbara Heindenreich, and Cockatoo Downs. Despite Pearl’s health issues, she was an amazing student and loved to learn. Moving to San Diego turned out to be even better than expected as the move coincided with the formation of ABI. It was love at first sight. And now, ABI can’t get rid of her. Kathryne brings with her experience training birds, mammals, and even goldfish. She has been involved with wildlife rehabilitation for years. She is a member of the IAATE, World Parrot Trust, Parrots International, Indonesian Parrot Project, and strongly supports parrot conservation efforts around the world.